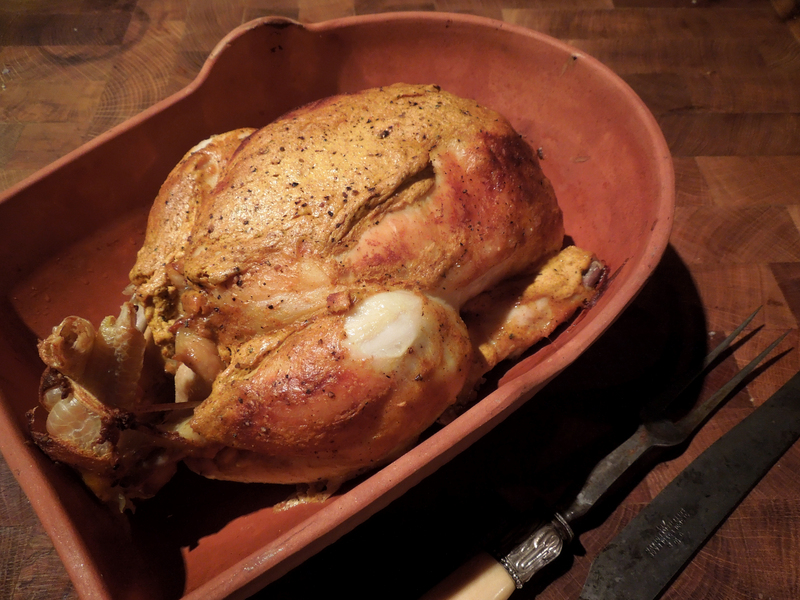 People have been baking meats in clay pots since time immemorial but the chicken brick, ubiquitous as a wedding present in the 1970s, seems to have gone out of fashion. I’m not sure why as they are brilliant for keeping a bird juicy and succulent. Maybe it’s because they’re such an awkward, bulky shape. When she was a student my sister-in-law Sarah had a part-time job at Habitat. Her work included shelf-stacking and it’s fair to say the chicken brick was her least favourite object. Funnily enough, I have a passing acquaintance with one of the early makers of chicken bricks, Suffolk potter Chris Soule. 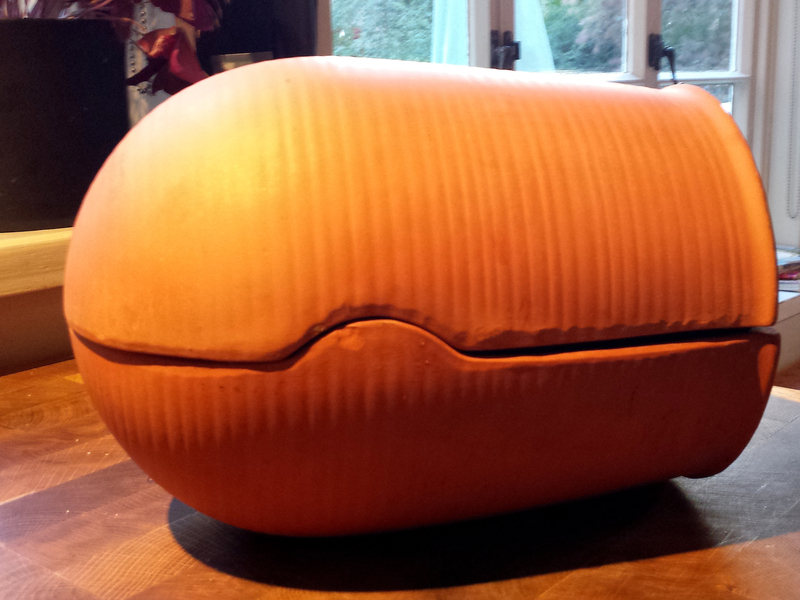 He began making a hand-thrown version for David Mellor cook shops back in 1975. It was Habitat though that made them popular, and Habitat that found a cheaper way to make them, pressing them out wholesale with machines. Chris meanwhile had evolved a new shape which he sold to Habitat as a tandoor pot. It seems Terence Conran never clocked the fact that it was a chicken brick by another name and Chris made a rather satisfactory amount of money. 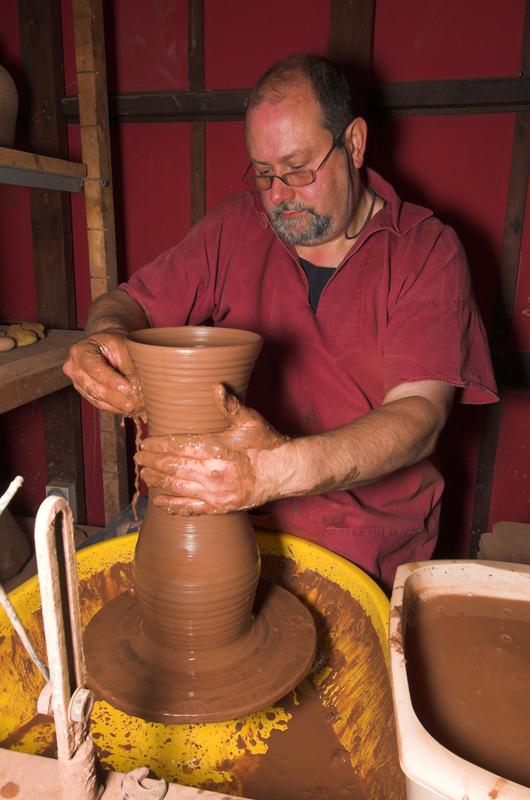 He has long since moved on but continues to make hand-thrown pots at his Suffolk studio. I don’t have one of Chris’s tandoor pots but I do have an old Habitat chicken brick. If you have either lurking at the back of a cupboard, hoick it out and give this a go. I know all the books say you should toast spices before using them and usually I do. In this case I just chucked them all into the yoghurt, along with the crushed garlic, and gave it a good stir. If you’d like to be purist about it and use whole spices, toast them and grind them, it would undoubtedly improve their flavour. I was in a hurry. 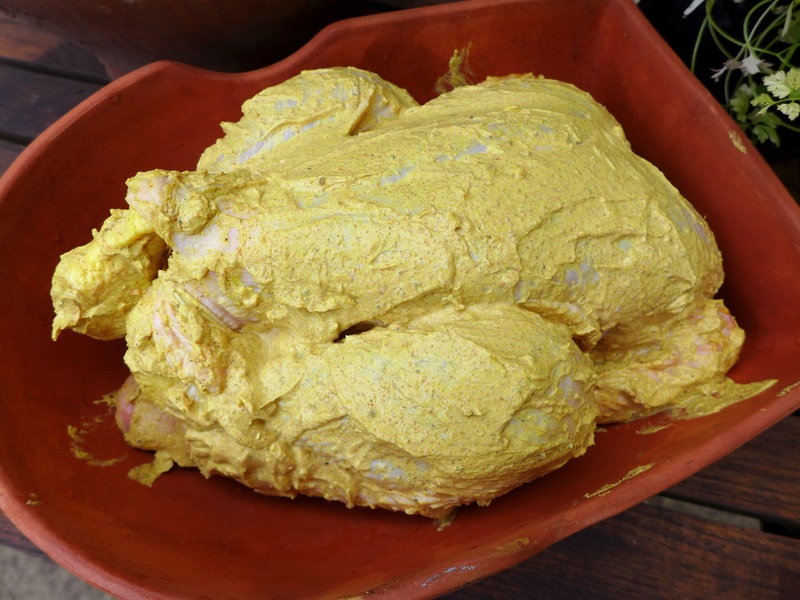 Slather the spicy yoghurt mix onto the chicken and set it aside to marinade for a couple of hours if you have time. If you’re using a chicken brick, soak it in cold water for 15 minutes before using and put it into a cold oven, adding 15 minutes to your usual cooking time. So dry the chicken brick, place the bird inside, put the lid on and put it in the oven. Turn the temperature to 375F/190C/Gas Mark 5 and cook for between an hour and 45 minutes and two hours. It should be golden brown and the juices should run clear when you poke a knife into the thickest part of the leg. 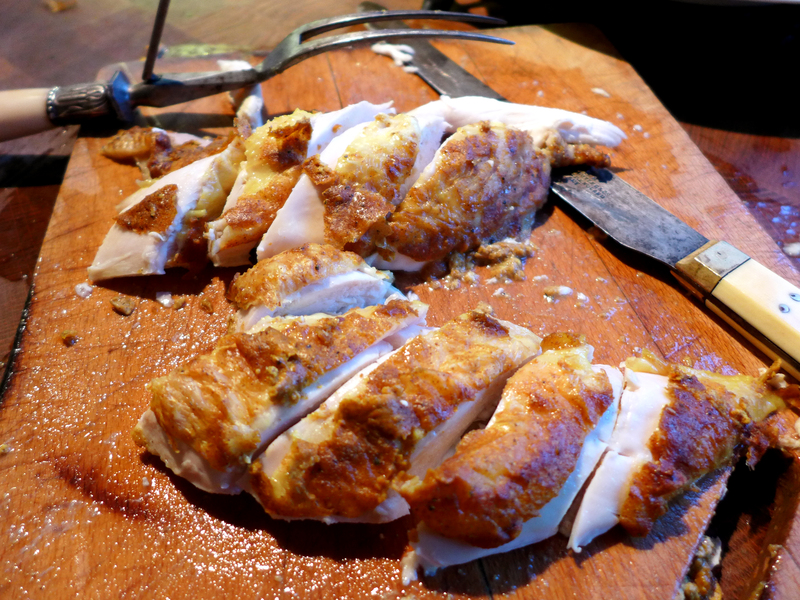 If you don’t have a chicken brick, put the bird in a roasting tin and tent foil over the top, pre-heat the oven to the temperature above and cook for about 20 minutes per pound/450g plus 20 minutes. About 20 minutes before the end of the cooking time, remove the dish from the oven and drain off the juices into a saucepan. Skim off the fat and reduce the remainder to make a sauce. Return the bird to the oven and if it’s not brown enough, leave off the lid for the remaining cooking time. This entry was posted in Chicken and other poultry, Mains and tagged baked chicken with yoghurt and spices, chicken bricks, Chris Soule, Habitat by Linda Duffin. Bookmark the permalink. Excellent looking chicken Mrs P. It’s funny how some fashions in food stuff come and go. I have managed to get this far without a chicken brick. If I see one at a market stall (along with fondu sets and 33 and 1/3 LPs, no doubt), I’ll buy it! Thanks, Nicole. What goes around, comes around, eh? I think I’ll pass on the flares though. No wait, fancy dress party!